You must make reservations at least 5 minutes in advance of the time at The Prune. The Prune is happy to host your special event and/or wedding. Previous guests have loved our beautiful garden setting, professional service and outstanding cuisine. Full scale catering and event management services offering the celebrated quality of cuisine and service for which The Prune has become renowned. Private Dining rooms available for groups of 2 to 50. The Prune and Bar One Fifty One offers contemporary Canadian cuisine that celebrates the bounty of local producers and growers. There are separate menus for each and they are equally as good as the other. The dining room menu is also available in the bar. The wine program showcases boutique labels from both local and international growers, and our front-of-house team offers elevated service in a casually elegant style. We pride ourselves on every guest feeling welcomed and fulfilled long after their dining adventure. Our newly renovated and cosmopolitan inspired Bar One Fifty One located inside The Prune provides guests with a full bar, a delicately created and unique cocktail list, wine and craft beer selections as well as a deliciously crafted food menu to pair with your drink of choice. Inquire by contacting The Prune or visiting Bar One Fifty One's own Open Table listing. Welcoming, approachable service of thoughtfully and skillfully prepared dishes in an elegant, unpretentious venue. 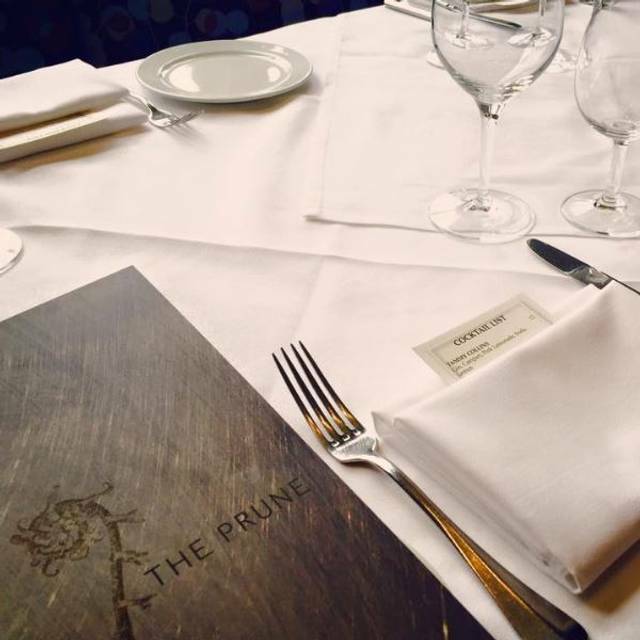 Dining at the Prune was a thoroughly enjoyable experience. We are addicts for the Prune's monthly Scoff & Quaff events. So much amazing food and wonderful service. It's a wonderful experience that we enjoy so much. incredible. The Prune has become our favourite restaurant. My only complaint would be that the music was a bit too loud. The speaker was right above our heads, so perhaps that is why we felt this way. Otherwise, we were extremely happy with our experience. Thank you to the wonderful staff at The Prune! Wow! We went to The Prune Restaurant for their new dinner series on Friday night titled Scoff & Quaff. We were wonderfully impressed with the entire experience. The Prune seems to have found their true identity with the new chef and management team! The food was comforting, the service was warm and the wine / beer were spot on. 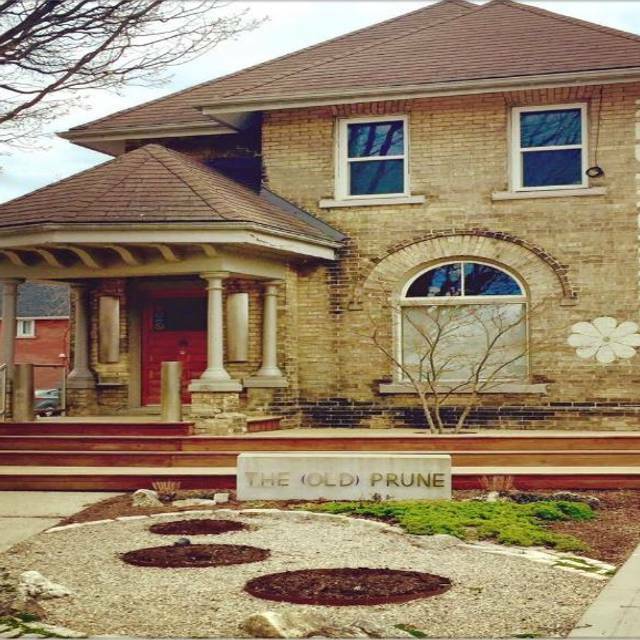 Stratford has a true gem with The Prune. We really hope they continue the Scoff & Quaff dinner series forever! Have not been to the Prune for many years. Apparently this was a mistake as I was blown away by the food and service ! Every course from amuse to dessert was memorable. Service was prompt knowledgeable and friendly. We came here because we had had a great experience last year. We were terribly disappointed. Menu riddled with spelling errors to begin with. Server asked if there were two bottles of wine we were ordering and she exclaimed ‘oh yeah! Lots’. Later in evening we were told last bottle had been served by the glass. Orders taken late, we explained we had tickets to an 8pm show. Although sweet the waitress spent her evening apologizing. 20 minutes for a ginger ale. ‘Greens’ were endive and radicchio and it would be much better to be forewarned that this was a cold side. Service slow, more apologies. She tells us coffee and tea can be ordered, this arrives at 748. But that was before the desert. We had to pay before they arrived and left them on the table. Pièce de résistance was the 4 tries on a credit card machine that had no connection. For what we paid leaving a course in touched on the table, no quality of food could make up for this. We had no time to give feedback and we were late for the play. Surely in a place like Stratford, getting people out on time for a show would be elementary. Couldn’t be more incensed or disappointed. excellent in all important criteria Food and Service were beyond expectations , a dining pleasure. One of the best meals I've ever eaten. One of the best meals I've ever eaten. One of the best meals I've ever eaten. We have eaten at The Prune several times now when my husband and I go to Stratford for a romantic getaway - theatre, restaurant, B&B. We are always very pleased with the food, service and ambiance. We recommend it to anyone who wants a good meal in a fun and romantic setting! Disappointed by the “sous vide” piece of beef. 2 guests wanted their meat rare and that cannot be achieved with that method. The Prune is lovely, but the price of the food doesn’t match the taste. The food is well done but not exceptional - which I’d expect for the price. They are charging Langdon Hall prices for food that is slightly above the Bauer Kitchen (Waterloo) level or about the level of Janet Lynn’s (Waterloo). My sister and I met in Stratford for a 'sisters ' weekend. We enjoyed our hotel and our meal at the Prune was beyond our expectations,exceptional in every way !! We will definitely return to this restaurant when we return to Stratford and I would definitely suggest this little gem to anyone going to Stratford !! Amazing dining experience!!! Every bite was fascinatingly delicious, and service was outstanding! Excellent food. Better than excellent service. Timely without being rushed. Loved the table looking out on the patio. Very relaxed. The service needs work...good food, pleasant environment but the waiters were friendly but not attentive. Halibut was over sauced and flat flavour; delicious pork shoulder and chocolate cake was very good but ice cream was bitter. Very good service. Excellent food. Will go again. Went for a special occasion and was not disappointed! 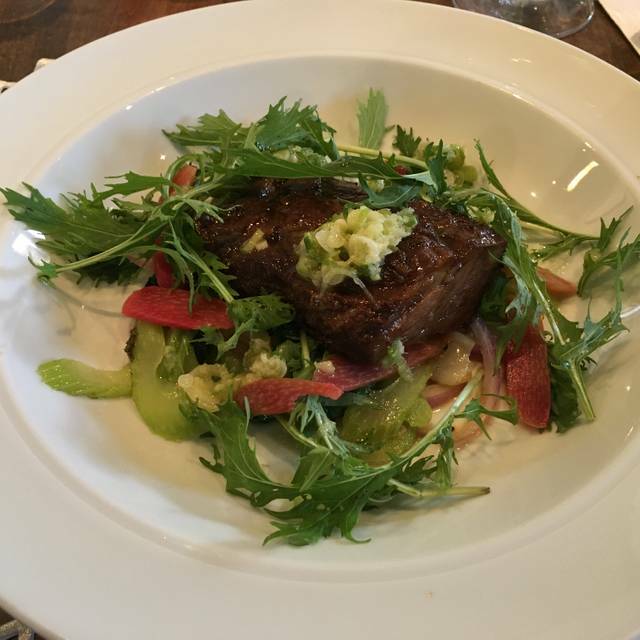 We ate at The Prune on Saturday, September 22. The Chicken live pate was outstanding. Susan and I will continue to argue whether the halibut or the short ribs were more spectacular. They were both wonderful. We had oysters from Prince Edward Island. We loved them because we had just spent a few days at PEI a month earlier -- these were good, but were far smaller than the oysters we ate on PEI. Deserts at the Prune were marvelous, and we can't even described them. It was a great dining experience. One of the best meals we have had in Stratford in recent years. This was our second visit to The Prune. The food was outstanding and the service was very good (although my water glass was not re-filled during the latter half of our dinner). We were celebrating our wedding anniversary and appreciated receiving complimentary flutes of bubbly. We LOVED all three courses which were imaginative and delicious! We also enjoyed the decor and ambiance (music not too loud), our server's quiet efficiency and the effort to have us out the door in time for our 8:00 performance at the Festival theatre. We will definitely return to this little gem next time we are in town. Excellent, interesting menu. Food beautifully presented and delicious. Portions reasonably sized. Not outrageously expensive (although not cheap either). Very strongly recommended for a nice night out in Stratford. We go at 8, after shows have started and we enjoyed a leisurely and pleasant evening. Great food, terrible service. DO NOT try to go here pre-theatre. We had a 5:30 reservation, and told our server when we sat down that we wanted to be out by 7:40. She said it wouldn't be a problem (which it shouldn't be.) But then after taking our drink order, she disappear for half an hour. That set the tone for our service for the evening. When we ordered a bottle of wine, another server opened the wine and started to pour it into a glass that had already been used. When we pointed that out, he apologized and said he would return with clean glasses, but then never returned. We had to ask our original server to find our wine. The food itself was very very good. Everyone was happy with their meals, and we thought it was creative and interesting. But the entire meal was spent worrying if we would get out on time for our play. This has been a consistent issue with us at the Prune over the years. We wanted to give it a try again because we're fans of the new chef, but we won't be returning for a pre-theatre meal. So disappointing. The "new" Prune is shaping up to be a complete success. The chef does a wonderful job of coming up with complimentary and creative flavor combinations. Food portions are now (as opposed to the austere former Prune) just right (ample, but not too much), and the pricing is very reasonable. The dessert dishes are unique and superbly flavorful. The wine list is small, but judiciously constructed. Service is very attentive and charming. The Prune is aiming to be one of, if not the, best restaurants and Stratford, and year one gets them off to a very promising start toward that goal. This is mainly a fixed priced menu place so you choose 3 or 4 things from a limited menu. It is expensive but very good. The server was friendly and attentive and it is quiet so you can visit, which I like. I did not care for the warm chocolate cake but everything else was excellent. Terrific meal. Wonderful friendly service. We had the chef’s tasting menu and every course was excellent. Service was fantastic, friendly and professional. Even though we showed up late (we thought our reservation was at 7pm instead of 6:15 pm) we were seated and served with grace. We had excellent wine, appetizers and meal with delightful service. Appetizers of foie mousse served with apricot mustard and fried squash blossoms filled with crab were very good and creative. Pork shoulder with mushrooms and leg of lamb with fennel were prepared perfectly. The bay leaf ice cream was very unique and quite good. Definitely happy we chose this restaurant. Repeat visit. Will return again, and again, and again. Truly a treat. We made a reservation for 6:15 at the bar in order to have a modest meal before the theater. We ordered a pasta dish that was quite good. However, we waited for almost an entire hour after ordering to be served. That is unacceptable. The bar is a small pleasant room. However, we were seated next to a large table of at least ten people. The noise level was not "energetic." It was deafening. That group should not have been placed in the same room as a table of two people who had reserved a week in advance. The restaurant needs to think about how to handle different kinds of diners so as to make them all comfortable. We were seated in front by bar. Not the greatest location. Very hot and humid inside. Waiter was very good. Very expensive. We’ve been going to this restaurant on and off for about 15 years. This is the first time we had an issue with our service. Our waiter’s head just wasn’t in the game. We ordered wine pairings and he forgot, and didn’t return to the table to check on us in a timely fashion. The food was, as always, delicious. My wife and I enjoyed a delightful dinner prior to attending a play at the Avon Theatre. Our server, Reagan, was a warm, welcoming person who provided thorough service. The martinis were very nice, the wine chosen was perfect for the meal (we both had lamb) and the desserts were unique. If I had any reservation, it would be to say that the chef overdid it a bit with the fennel on the lamb. The breads were really a treat and the foil gras was inspired. We opted for a matinee at the Festixal so we did not have to rush dinner. So glad we did. Joshua looked after us with great service, unique wine pairings and interesting stories. The tasting menu selections were bright and flavourful. Perfect summer's eve. So happy to have found this gem of a fine restaurant. Locally sourced ingredients such as tomatoes and corn elevate appetizers and mains. I re commend the bay leaf ice cream for dessert. 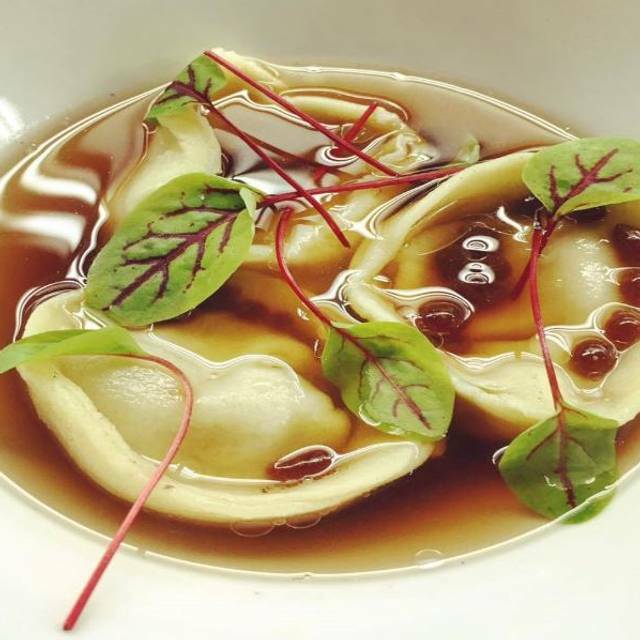 The Prune always offers a wonderful dining experience. The service is friendly but still elegant, and the food is fabulous. The ingredients are locally sourced and combined in very innovative ways. The wines are also very well selected. Food was excellent. Prepared and presented quite well. Great wine selection, and excellent for post theatre dining. We were in a windowless section and would have appreciated more natural lighting. Service is a little slow, but absolutely delicious food. This restaurant suffers from poor service plan. The wine pairings arrived half way through the course. The lamb was tepid when served and my water glass was empty for 10 min. Still good food and quality ingredients. It will not be part of our annual trip to Stratford next year. On a rainy night in August we were delighted by the warm ambience at neighbourhood converted house-to-eatery, walking distance from our lodgings, The Prune. Christopher our experienced and exceptional server was attentive and interesting. The service was not rushed. We picked a later hour and explained we wanted to take our time and were not heading to theatre. The food exceeded our expectations. Each course was surprising and delicious with mouth watering bursts of tastes from food combinations and seasonings never before experienced by us. The foie gras was superb and creamy as reviews had suggested , the halibut - my favourite food- was served with edamame beans and oyster coulis. Amazing!! We did order the optional bread which was perfect with our courses. Go there. One of the best fine dining experiences I've had in ages. The prix fixe menu was delicious, with excellent choices, reasonably priced for the quality of the food. The service was fantastic. I had begun to give up on the prospect of attentive, unobtrusive and attitude-free service, but my experience at The Prune reassured me that good service can still be found. The decor and atmosphere were also lovely.